This Fresh Cut Notes pocket card was created during my last Technique Class: Special Folds. You've already seen the Shadow Box and the Tunnel Card (last 2, previous posts), and I used the die-cut Notes card to make a pocket. 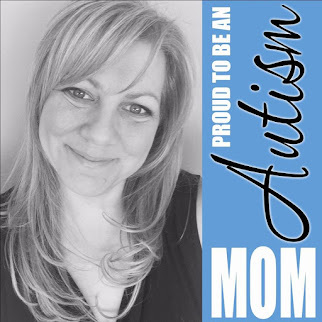 This card is relatively simply and can be made in any color and for any occasion! Cut a piece of textured Baja Breeze card stock for the back (3-1/2 x 4-1/2). Then on the right side use the Scallop Edge border punch. Cut a piece of Baja Breeze Prints Designer Series Paper in a 3x3 square and adhere it to the textured card stock as shown above. Cut the Fresh Cut Notes card to 3-1/4 x 3-1/4. However, to keep flower centered, you have to trim it equally on both the top and bottom (not just to trim from one side). So, in total you trim the right side (leaving and keeping the fold in the Notes card on the left side), then you trim a little on the top and then the same amount on the bottom until the desired 3-1/4 x 3-1/4 is left. Now, we're ready to stamp. Notice the diagonal in blue ink. We used masking to protect some of the card from the blue ink. Using a piece of scrap paper, cover 1/2 the card (on a diagonal). Then using the Baja Breeze Classic Ink pad and the background stamp in the Fresh Cut stamp set, stamp on the lower, left area of the Fresh Cut Notes. 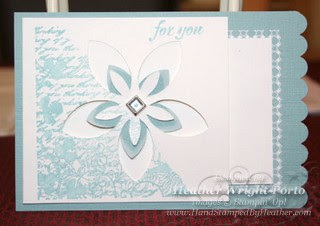 I then used the 5-petal flower punch to punch 1 flower in textured Baja Breeze. Then used Craft White ink and rubbed it around the edges of the flower. Using the piercing tool from the Crafter's Kit, pierce a hole in the middle of the flower die-cut, and also in the middle of the punched flower. Place the punched flower behind the die-cut and then place a square blue Rhinestone brad (Ice Collection) thru them both. Adhere the Notes card to the back of the card (over the prints/patterened paper and textured paper as shown above). Now, on the inside of the Notes card, adhere tape to the top and bottom borders --- do NOT tape in the middle or the right --- this is forming the pocket. Then close the Notes card. Now the top and bottom are closed but the pocket (in the middle) is still open. Now cut a piece of 2-3/4 x 3-3/4 in Whisper White to use as your greeting, the piece that will slide in and out of the pocket. NOTE: Your greeting will be written or stamped on the back of the Whisper White paper so it doesn't show thru the die-cut flower!